Armagh slipped to a second defeat in Division Two despite a brave second-half comeback at the Athletic Grounds. Paul Cahillane's 13th-minute penalty helped Laois lead 1-7 to 0-6 at half time and they were seven points ahead early in the second half. Kieran McGeeney's side played their best football in the final quarter, Stefan Campbell and Micheal McKenna leading the charge. They twice closed to within a point but were unable to find an equaliser. With four Ulster derbies still to come in this division, newly-promoted Armagh now face a fight to avoid an immediate return to the third division. In Saturday night's other Division Two fixture Derry won by a point away To Cavan. Both sides were desperate for the points having lost their opening fixtures last weekend. Paul Cahillane's confidently-struck penalty in the 13th minute put Laois ahead for the first time and they stayed in front for the rest of the game. They had the benefit of a strong wind in the first half and held a four-point interval lead. Three Campbell frees in the opening nine minutes had Armagh 0-3 to 0-1 ahead but Paul Cahillane's penalty, after Gary Walsh was tugged back in the square, was a momentum-changer. Armagh made a lot of basic handling and passing errors, but Colm Watters had a great goal chance which was superbly tipped one-handed onto the crossbar by Laois goalkeeper Graham Brody in the 31st minute. Laois piled the pressure on after the restart with points from Niall Donoher, Evan O'Carroll and another Cahillane free to move 1-10 to 0-6 ahead after 47 minutes. Corner-back Shea Heffron popped up with Armagh's first score of the second half and after three points inside 90 seconds, two by McKenna and another by Campbell, who top-scored with 0-7, the comeback was on. Donie Kingston's free stopped the rot but it was brief respite for Laois, with points from Niall Grimley, Campbell and Ethan Rafferty bringing Armagh to within a point. 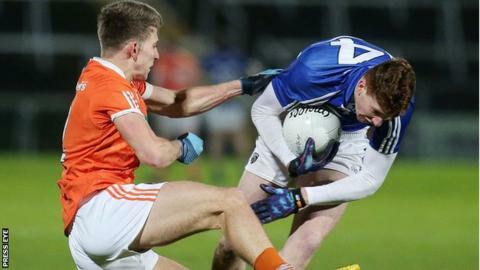 Evan O'Carroll boomed over a '45' for Laois and the intensity began to fade out of Armagh's comeback, despite Campbell hitting two points late on.